According to internal documents at Microsoft, USB mass storage support will be coming to the Xbox 360 this spring. A document written by a senior software development engineer at Microsoft outlined how you will be able to plug in a USB drive to your Xbox 360 and directly download Xbox Live Arcade games, Xbox Live Indie games, Games on Demand, DLC and Title Updates directly to the drive. You will even be able to put a full disc-based onto the USB drive and run it from there, but you'll have to have the disc in the drive to authenticate it. While still not officially announced, if USB mass storage support is a reality, it may mean that Microsoft Memory Units for the Xbox may be cut out entirely. The update is slated for Spring 2010. "USB storage devices may, however, have far greater memory capacity than MUs (at the date of writing, the largest MU is 512 MB), and may therefore support previously infeasible operations-such as installation of a full disc-based title," the document stated. The document goes on to more technically describe how USB mass storage would function on the Xbox 360. When you first insert the device, you'll be prompted to do a "complete" format or a "customized" one. Selecting complete format will overwrite all that's on there while customize will allow you to keep music or other files on the drive. The smallest size drive supported is 1 gig, and the process sets up a partition of 512mb for system and the rest of the drive as storage. Right now, the maximum supported size is 16gb and there's a hard limit on the number of drives you can have connected at any one time. Only the first two USB drives you connect will be recognized. Still, with two 16g drives, you'd be able to sport 32g of storage without needing to purchase a pricey Xbox hard drive. That's boon to all of you Xbox Arcade owners out there. 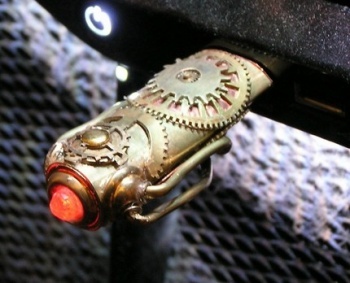 And for the record, I totally want to use that steampunk USB drive with my futuristic-looking Xbox. It'd be so anachronistic!